Toads can live in a variety of different areas such as tropical rain forests, high mountain regions and hot deserts, but prefer moist environments. 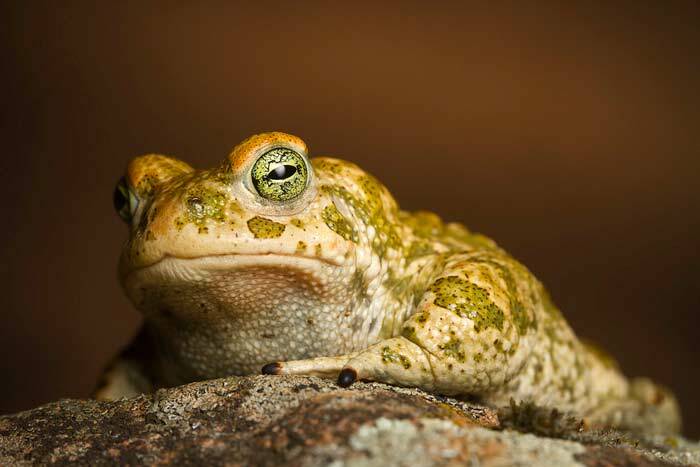 Toads breathe through their skin. A gland on the back of the toad’s head secrets a poison when the toad is threatened. Therefore always wash your hands after handling a toad! Some predators such as grass snakes and hedgehogs are immune to the common toad’s toxin. Toads may like on their backs and play dead to avoid being eaten. Some toads such as the Fire-bellied toads from Asia and Europe also have bright orange markings on their underbellies warning predators about their toxic skin. Toads are build with thick skin that has a number of warts, which can range in color from red and yellow to brown and gray or black. Contrary to myth, you will not get warts from touching a frog. Toads grow in stages much like frogs wherein they first appear as eggs. From eggs, the toad hatches into a tadpole. Tadpoles swim in water and then grow up into the toads that people are familiar with. Unlike frogs, toads live on land, but like to be near water.